An overview of 1950s Italian and Italian-American music, featuring Sophia Loren, Connie Francis, Dean Martin, Perry Como, Mario Lanza and many more. "Continuing a series exploring the popular music of Europe, Echoes Of Italy offers the ideal snapshot of Italian music in the fifties. This superb collection offers almost two and a half hours of great performances by such legends as Sophia Loren and Mario Lanza, as well as artists like Marino Marini and Domenico Modugno, who enjoyed international chart success as the world succumbed to the charms of Italian pop. Echoes Of Italy casts its net wide to also explore the ties which bound Italian-American performers to the old country. Around the start of the twentieth century, there was a mass immigration of Italians to America and as a result there are many, very popular Italian-American singers. We have included Perry Como, Connie Francis and several other entertainers. 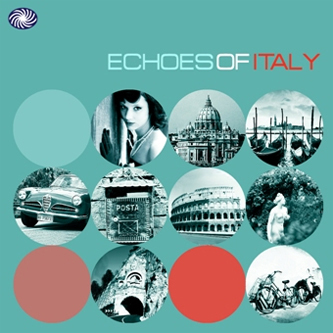 The more unusual tracks on Echoes Of Italy include Sophia Loren praising the mambo and Dean Martin worrying about his Italian pronunciation! There are the personality-laden voices of Louis Prima and Lou Monte and, in complete contrast, some Italian protest songs."